Don’t lose your voice! MK planners are at it again. Weds 4 Jan deadline. Council planning officers are still trying to silence dissenting voices and take more powers to decide applications behind closed doors. 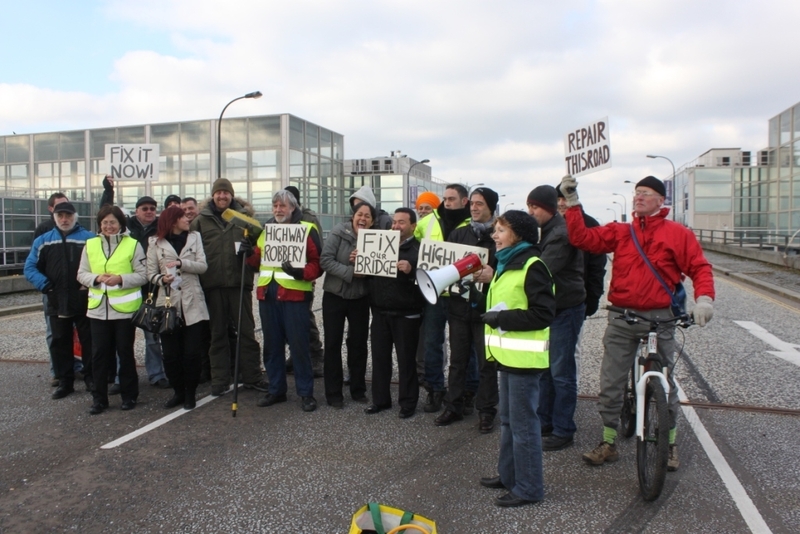 Xplain protesting over the scandalous closure of Secklow Gate, back in 2011. After facing universal condemnation for trying to rush through public gagging orders last autumn the same cheeky officers have now produced a Survey Monkey ‘consultation’ which is full of loaded questions. If you trust these people to make fair decisions, that’s fine – do nothing. But if, like Xplain, you think that local voices are vital to good development then please see our pitfall guide below, and fill in the official MK Council form before 5 pm, Weds 4 Jan. There are only 10 questions and it’s an anonymous survey with comment boxes. You can skip questions or ask a few of your own! Q1. Which group do you belong to? (ie a parish councillor, business person, resident, developer or ‘other’? What is the point of this question when the survey is anonymous? Q2. What type of development is most important to you (rank the choices which include ‘more affordable housing’, regeneration, ‘MK should expand wherever possible’, ‘no more development’). An incredibly leading question. Unless officers are trying to earmark the respondent as an irritating Nimby the question is totally irrelevant. This is supposed to be a consultation about HOW applications are dealt with – not WHAT sort of development MK needs. Q3. Do you agree with the statement: Councillors should make planning decisions if it is a major scheme with significant impact on MK whilst smaller schemes can be left to Officers. Pitfall alert! Even ‘minor’ applications of less than 10 houses or a commercial building of 1000 sq metres can cause a lot of problems if built in the wrong manner or wrong place. Local involvement from residents and parish councils is vital to a successful planning process so where officers do not agree with objections from local people/parish councils they should not have delegated authority to decide ‘minor’ applications by themselves. Instead, elected councillors should be involved by hearing such cases at the panel or committee. Q4. Do you agree with the following statement: there should be a compulsory requirement for any Town or Parish Council/Ward Councillor who initiates a decision to go to Committee stage to be present or at least represented at least at the debate. An odd question but here’s the background: much to the annoyance of Town and Parish Councils, officers have been trying to make out that they waste time and money raising irrelevant, off-the-cuff objections which they then fail to follow through by failing to attend the planning committee. Actually, this is not true. Most parish councils spend a lot of time studying planning applications in their patch and had assumed, until now, that sending in written responses was enough for their concerns to be taken seriously. Obviously not! Officers (who are paid) now want parish councillors (who are volunteers) to be obliged to turn up for meetings too. If, however, minor applications are not automatically dealt with by officers, and parish councils have the option of escalating a controversial case to the committee and are guaranteed speaking rights, then it would be fair to require them to attend. Q5. Do you agree with the following statement: speakers for and against a proposal should not make duplicate statements during a debate so that the time is used more effectively. You might want to challenge the assumption behind this question. With only 3 speakers, taking 9 minutes in total to object, how much time would actually be ‘saved’ by stopping people making duplicate statements on the rare occasions that they actually do? Q6. Do you agree with the following statement: The chair should exercise their powers to stop speakers repeating and duplicating comments. Still harping on this minor point! See above. In our experience people speak well and to the point. The planning committee chair usually tries to put members of the public at their ease. This heavy-handed approach would do the opposite, interrupt people’s chain of thought, and put people off speaking at all. Or is that what officers want? Q7. Do you agree with the statement: The Council should look to reduce costs in the determination of planning applications. An innocent-looking question – but loaded all the same. It implies that costs incurred to maintain the current, minimum level of democracy in MK are ‘bad’ costs and ripe for cutting. Ironic stuff from a Council that has gone to the enormous cost of hiring the UK’s top barristers to approve Intu’s planning application, against the clear wishes of the CMK Neighbourhood Plan! Why not add a question of your own, eg ‘Do you agree that MKC’s planners should stand up for democratically adopted Neighbourhood Plans, thereby reducing time and money spent dealing with a large number of ‘repetitive’ objections from disenchanted members of the public? Q8. Do you agree with the statement: Those making representations should be given equal time and rights. Yet another misleading question, because speaking rights between applicants and objectors are already equal. What they’re really angling for is justification for their earlier idea of extending applicants’ speaking rights by letting them drag in hapless employees to speak ‘in favour’ of their application. This would counterbalance residents who genuinely speak ‘in objection’. But applicants already have the whip-hand! They often meet officers, ward councillors and even members of the planning committee to discuss their schemes long before filing applications. Once filed, they have regular contact with officers, assuaging any concerns and threatening them with costly appeals if their schemes are refused. Parish Councils, citizens groups and residents who object to inappropriate development do not have any of these advantages or rights, therefore Xplain believes that the current speaking arrangements (9 mins max to object, 9 minutes to reply) should remain. Q9. What are most controversial aspects of any application (rank in order – eg opposition from neighbours, loss of trees, design etc etc)? Odder and odder! Officers know that only the last one, ‘departure from established planning policy’, is relevant. We recommend marking everything as ‘not applicable’ except the last option. a. Performance of the planning department should be judged on public levels of confidence and trust – not simply the speed with which officers despatch applications! b. Speaking rights should stay the same. Any attempt to cut speaking rights would drive a wedge between the public and their elected councillors and public confidence in the planning department and trust in MKC would fall still further. c. For clarity, objectors should be able to ask a few questions of officers and applicants, and members of the committee should be able to ask a few questions of objectors (as well as applicants, which they are currently able to do). d. All recognised civic organisations including MK Forum and Xplain should be afforded the same rights and responsibilities as Parish and Town Councils. This entry was posted in General, Milton Keynes, Neighbourhood Plans, urban planning and tagged local democracy, MK Council, Urban Planning in Milton Keynes on January 2, 2017 by xplain.